As the Southern League headed into its fifth campaign in 1935, Babe Ruth appeared on the major league stage for the final time as a member of the Boston Braves, the first major league night game was played in Cincinnati, Elvis was a new-born and, emanating from Regina. the cradle of the Southern League, came the infamous "Regina Riot", a knee-jerk reaction, with disastrous implications by authorities toward depression trekkers. Expansion was the name of the game as 1935 saw the Southern League double in size from three to six entrants with Estevan and Arcola, formerly of the Border League, enter the fray as well as Weyburn, an unaffiliated club. Back to renew rivalries for the campaign were the Moose Jaw All-Stars plus the two Regina forces, the defending league and provincial champion Nationals and the newly-named Windsors (that's infielder Bryan Forster of the Windsors at the above right), taking over the Young Liberals' franchise of a year ago. The expanded loop will operate as a two-division circuit with all the new teams comprising a southerly division while the established clubs encompass the north. Each team has a 36 game schedule of which 12 are inter-divisional. Both groups are to declare champions with the two winners meeting for the overall league crown. Just south of the border, 1935 marked the championship season of an integrated team from Bismarck, North Dakota. 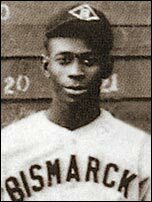 (This is more than a decade before the Dodger's signed Jackie Robinson). Featuring Satchel Paige (left) and Double Duty Radcliffe, the club captured the title in the inaugural National Baseball Congress Championship at Wichita. 1935 also brought the North American visit of the Dai Nippon Baseball Club of Japan. The team toured the United States and Canada. This was the team which later became the Tokyo Giants of the Japanese Baseball League. Two of the young pitchers on Dai Nippon, 19-year-old Victor Starffin (left) and 18-year-old Eiji Sawamura, would go on to Hall of Fame careers in Japan. 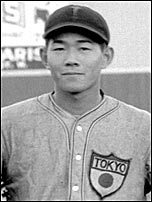 In the fall of 1934, Sawamura faced a team of touring major league all-stars in Japan and in a relief role, he fanned nine including consecutive strikeouts of Charlie Gehringer, Babe Ruth, Lou Gehrig and Jimmie Foxx. Former big-leaguer Ike Davis (left) turned up as playing manager of the Wetaskiwin Braves of the Northern Alberta League. He had piloted the Edmonton Shastas to the Northern Alberta crown in 1934. 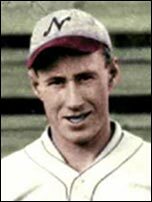 The little shortstop, 5-7 and 140 pounds, had his first taste of the major leagues with the Washington Senators in 1919 and had one full season in the majors with the Chicago White Sox in 1925 when he hit .240 with 31 doubles, 9 triples and knocked in 61 runs. The 40-year-old Davis moved on to head up the Medicine Hat Royals of the Southern Alberta League the following season, but in spite of success on the field the Royals disbanded and the Southern Alberta semi-pro loop folded. It appears the failure of the Lethbridge Bears to field a competitive team was a major reason for the circuit's collapse. Bears made such a weak showing that the Calgary Mustangs and Medicine Hat couldn't attract good crowds with Lethbridge as the opposition. Davis and his fellow imports headed to clubs in the Northern Alberta league, chiefly in Ponoka and Wetaskiwin. Davis' Wetaskiwin nine claimed the Alberta Senior Championship after holding a 3-1 game lead in the best-of-seven final series with Ponoka. However, the Alberta Baseball Association upheld a Ponoka protest and awarded the title to the Panthers who then declined to accept the title. Ponoka wanted games to be replayed, but Wetaskiwin refused and the team disbanded. The protest was over Wetaskiwin's use of an ineligible player. Vancouver's Terminal League saw a marvelous final series featuring three no-hitters and a comeback from a 3-0 game deficit. One of the no-hitters turned out to be a loss. Bush League? Yes, there really was a Bush League. The Crossfield (about 50 km north of Calgary) Chronicle of June 6, 1935 carried the schedule for the four team league which including the communities of Dog Pound, Atkins, Water Valley and Cremona. Bottrel was to have been an entry but pulled out just before play was about to begin. (July 6) Righthander Herman Loblick of the Edmonton Shasta Royals, 29-year-old farmer from Spruce Grove (left), tossed a no-hit, no-run game as the Capital City gang whitewashed Wainwright 7 to 0 in an exhibition game played in Edmonton. Only 28 Wainwright batters faced Loblick in the nine-inning contest. 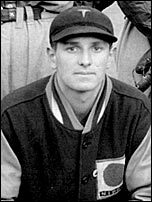 (July 9) Lester Webber (right), a 19 year old Californian pitching for Wetaskiwin, hurled a no-hitter as the “Ike” Davis led squad shutout the replacement Edmonton NABL entry, the Shasta Royals, 4 to 0. Webber faced only 28 batters in his masterpiece. Loser Glen Wilkie pitched admirably as well, giving up just four hits with only two runs being earned. Below - baseball warm-up for a game in Fort William, Ontario (now part of Thunder Bay) in 1935.